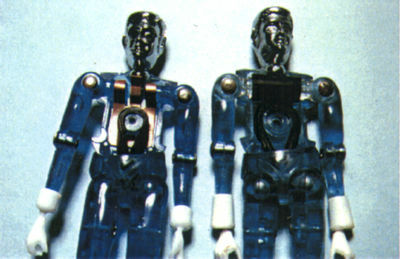 Here are special mail-away figures which are generally regarded to be the most difficult Microman figures to obtain. There are very few examples in the hands of collectors. 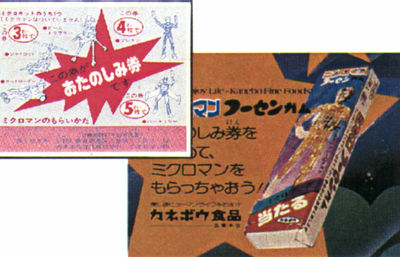 In addition to the figures, also note the promotion (below) which alerted kids to the mail-away. 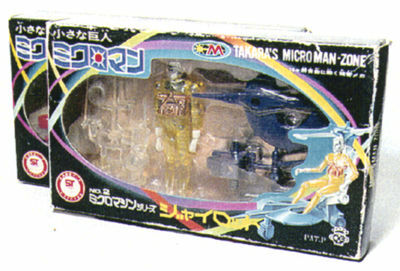 These promotions showed up in Microman capsules and boxes. 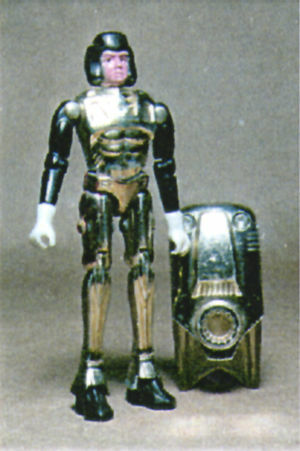 Shown here is an all silver version of the Micronauts Galactic Warrior equivalent. 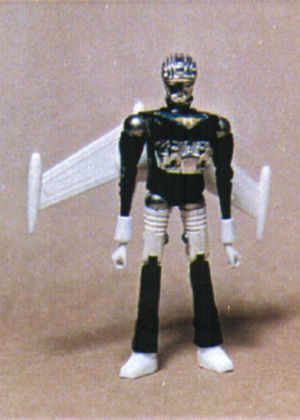 Note that it is based on the second iteration of the figure - it has the long cuffs on the wrist and a peg-hole in its back. A mail away Titan and the notice announcing it (below). 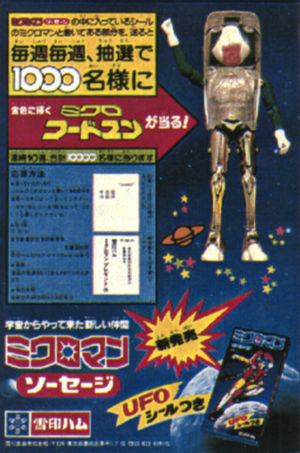 An all silver Hoodman mail away. 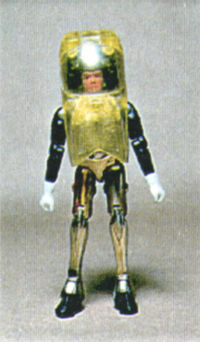 Note that this one is die-cast and not plastic. 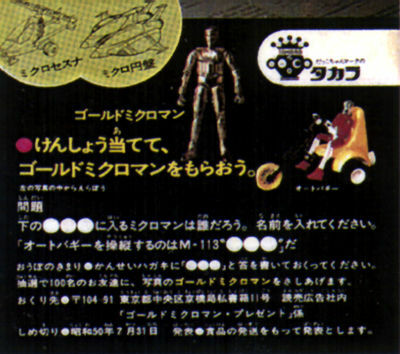 Another picture of the same figure and of the mail away notice are shown below. 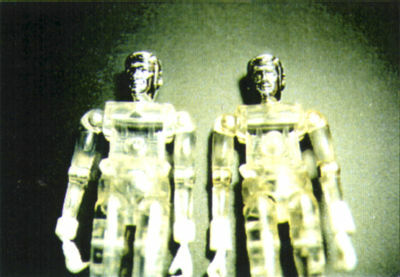 A very interesting variation in the first Microman line: the very first figures from the M10X series did not have the esteemed rubber sleeve holding the head up and the arms in. 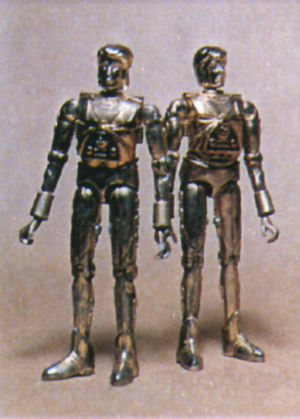 Instead, a stamped brass piece held each arm in individually while a small platform supported the head. These are exceedingly rare. Another variation in the M10X series. Some figures were lacking the round, raised circle that surrounds the peg hole. Also, the piece into which the end of the torso screw went is less substantial on those lacking the raised circle (as shown below). 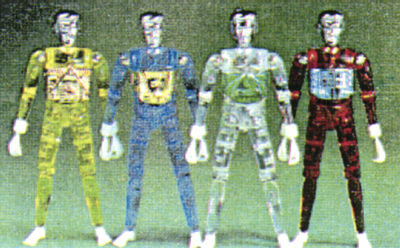 You might recognize this picture as the picture of the first four Microman figures ever to be released, under the title Microman Zone. Only there are a few major differences! These four figures all have realistic, human feet and elongated hands with shortened wrist cuffs! 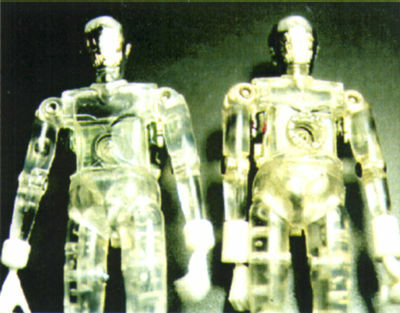 The feet are a holdover from the previous 12" Henshin Cyborg action figures, upon which the initial Microman line was based. 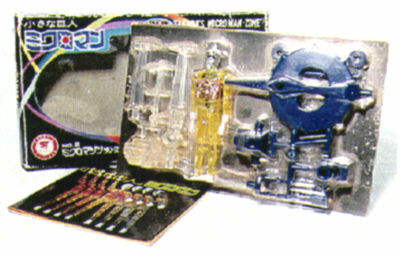 Below are boxes from Microman Zone.